In a shallow glass bowl, combine orange juice and olive oil. Add fish and marinate for 10 to 15 minutes. In a small bowl, combine mango, tomato, onion, green chili and cilantro. Set aside. Grill or broil fish 3 to 5 minutes on each side or until just cooked. 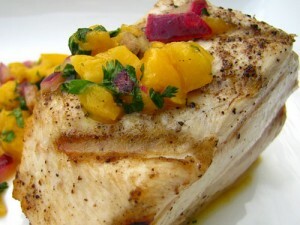 Serve each fillet with 1/4 cup mango salsa. 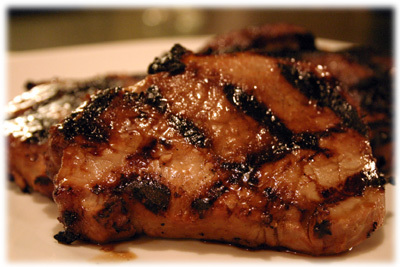 Here’s an easy and tasty recipe for BBQ-ing on Hot Summer Days! Prep: 15 min. – Marinate: 4 hrs. – Cook: 14 min. occasionally. Remove pork from bag, reserving marinade. each side or until done, basting frequently with reserved marinate.